PRESS RELEASE: Avid today announced Pro Tools version 9 - a groundbreaking evolution of the industry's most popular music creation and audio production solution. Leveraging a next-generation architecture, version 9 of Pro Tools offers customers the unprecedented choice to work with Avid audio interfaces, third-party audio interfaces, or no hardware at all when using the built-in audio capabilities of a Mac or PC. This first-ever software-only option for Pro Tools delivers customers the most open, flexible and feature rich version in history, while also providing top professional features customers have requested. Also, new support for the Avid EUCON open Ethernet protocol now enables customers to expand control surface options to include Avid's Artist Series and Pro Series audio consoles and controllers (formerly known as Euphonix consoles and controllers). Pro Tools customers - from the aspiring enthusiast to the professional - can now create sophisticated, great sounding mixes, whether they're at home, on the road, or working in a large facility using an open, flexible workflow for enhanced collaboration and creativity. · Versatile workflow design options—Enables customers to work the way they want using Pro Tools as a software only tool, or with hardware options that include either a variety of Avid audio interfaces for an Avid-advantaged workflow, or third-party audio interfaces as a result of new Core Audio and ASIO driver support. · EUCON support—Delivers more hands-on mixing options to customers using the new Pro Tools software offering or Pro Tools|HD systems with the ability to deeply control Pro Tools through EUCON integration using any Artist Series or Pro Series audio controller or console, in addition to Avid and third-party audio control surfaces. · Automatic Delay Compensation - Equips customers using version 9 of Pro Tools with the ability to create better sounding mixes faster. Users can now mix and record with increased alignment and phase accuracy, without the need to manually compensate for latencies from hardware I/Os, internal and external routing, and plug-in algorithm processing - the number one request on the Pro Tools IdeaScale User Forum. · More audio tracks and busses - Allows customers to create more elaborate music and audio productions, with support for 96 mono or stereo voices in the new software-only version of Pro Tools (192 voices with Pro Tools HD systems), 256 internal busses, and 160 aux tracks. · Advanced production toolset - Gives customers access to standard professional tools in version 9 of Pro Tools to create more polished mixes out-of-the-box. Users can analyze and adjust timing across multiple tracks for tighter rhythm with the built-in multi-track Beat Detective module, improve organization and asset sharing with the DigiBase Pro file management tool, and save time with full Import Session Data dialog. · OMF/AAF/MXF interchange and MP3 export - Provides customers with simplified session and file exchange between applications. · Built-in Time Code Ruler - Enables customers to achieve greater accuracy when syncing audio to video in post production (software only configuration of Pro Tools). · Updated 7.1 surround panner - Allows customers to more easily mix multichannel surround for full film sound production. · New variable stereo pan depths - Equips customers with authentic and precise track panning capabilities to achieve analog-console feel. Ulrich Wilde, producer and engineer for bands including Dethklok, Pantera and the Deftones, said: "One big thing about Pro Tools being an open platform is that I won't have to run two systems anymore. Right now I have a dedicated Pro Tools system and a dedicated Apogee system and I have to reboot with one or the other—now I can save space and time toggling between them. EUCON support is also huge for me as I'll be able to integrate Pro Tools into my studio workflow, which is based on Logic using an Artist Series controller." According to Lyle Workman, composer for films such as The 40 Year Old Virgin and Knocked Up, and guitarist for performers including Sting, Beck and Shakira: "I can't think of a reason why someone wouldn't want to work in Pro Tools - it's for the person who's getting started, yet it's for the person in my world. It provides all of the advantages of smaller systems, yet works from my studio to the music editor's room to the stage. It's incredibly convenient that there are no cross-platform issues. It's just Pro Tools from soup to nuts!" Jesse Keeler (aka JFK), artist and producer for MSTRKRFT, said: "The one barrier to total productivity for me while travelling has always been the lack of Pro Tools session portability. But now that Pro Tools is available as a software only package, Avid has made it so the same session can be worked on anywhere. For me, this feature alone is priceless." 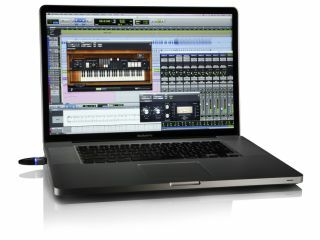 Version 9 of the new Pro Tools and Pro Tools HD software will be available worldwide on 12 November 2010 starting at £430.00. For more information on features and availability, visit: www.avid.com.